For “Domestic Eccentric”, Old Man Luedecke has teamed up with multi-instrumentalist Tim O’Brien to produce an intimate, home-recorded set of songs covering a wide variety of themes and styles. The songs are very, very good (actually, a couple are excellent), the performances are spot on and there’s a really effective mix of traditional bluegrass playing and vocal harmonies with modern lyrical ideas. The inspiration for most of these songs comes from his life as a young parent and the idea of recording almost everything in the home setting creates a very intimate feel. “The Briar and the Rose” (sounding a little like early Jackson Browne with a banjo), “The Early Days”, “Chester Boat Song” and “Now We Got a Kitchen” all give a slightly different slant on settling into a family life, while “Hate What I Say” and “Happy Ever After” seem to belong to a slightly different pre-domestic bliss era. 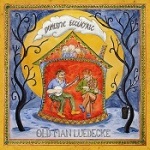 Luedecke likes to bring a poetic sensibility to his lyrics, indulging in wordplay and the fusion of incongruous ideas, which is great when it works well: ‘If it rained forty days and it rained forty nights, Would you be my plus one if we could find the ark?’ (“Wait a While”), but sounds a bit clunky on the opening song, “Yodelady”. “Domestic Eccentric” is a long way from being a bad album, but the sublime moments are the domestic ones and the eccentricity stops the album from achieving greatness. It’s difficult to maintain the intensity of the personal, autobiographical songs over a whole album and the unconvincing moments on this album tend to come when the mood lightens; the album wouldn’t suffer significantly if the opening song and “Real Wet Wood” (despite the great half-line ‘better to burn out than explode’) were both removed to bring it down to twelve songs, making “The Girl in the Pearl Earring” the opening song. The album does have some truly great moments and you really should give it a listen. “Domestic Eccentric” is out now on True North Records (TND 605).